Discussions Magazine Music Blog: SPAZ reviews RUPERT HINE and QUANTUM JUMP! SPAZ reviews RUPERT HINE and QUANTUM JUMP! Rupert Hine is rightly hailed as one of the finest producers of the last 30 years. However, it is his work as an artist in his own right that remains sorely overlooked. For five decades, he has maintained a low-key career as a singer, songwriter and musician with varying degrees of success. He was one-half of ‘60s folk duo Rupert & David before recording two solo albums in the early ‘70s. 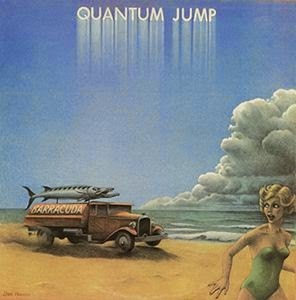 In the mid-‘70s, he formed the Jazz/Rock outfit Quantum Jump, who lasted two albums before splitting up. Since then, he has devoted most of his career to producing, although he did release a handful of solo albums throughout the ‘80s and into the early ‘90s. With each release – under his own name and under the band pseudonym Thinkman – Rupert’s albums got progressively better until he released his finest work, The Deep End, in ’94. Unfortunately, that was also his last album. Twenty one years on, we still await his next ‘pop’ release. Until he releases something new, we must satisfy ourselves with his back catalog. Three titles have surfaced recently – two expanded reissues and a ‘best of’ - that are well worth checking out if you haven’t yet discovered his music on your own. 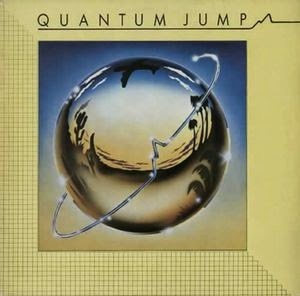 Quantum Jump was a band he formed with guitarist Mark Warner, bass player John G. Perry, and drummer Trevor Morais. The band’s self-titled debut album, originally released in 1976, is a fascinating dive into the more melodic side of Jazz/Rock. Steering clear of pretentiousness, the album is quirky, funky, laid back and refreshing. While the sound of the album is a tad bit dated, the band’s forward-thinking song arrangements are not stuck in the mid-‘70s. Though Hine is the vocalist and some would perceive him as the ‘leader’, each talented band member shines on the album. The hit single “The Lone Ranger” is the standout cut on the album but most everything else is on par with that slab of ingenious fun. The band’s fame didn’t spread to America although they did certainly have a small but devoted fanbase over here. This expanded edition includes four bonus tracks – remixes of four of the album’s songs, originally released on the 1979 album Mixing. One of those tracks, “The Lone Ranger”, became a hit the 2nd time around when this remix was released. Those who enjoy Hine’s off-kilter approach to Rock/Pop will find much to love here. The band reconvened in the studio to record their second album, Barracuda, without guitarist Mark Warner. Released in 1977, the album wasn’t a huge stylistic change from their debut, although the energy of the band didn’t seem to be firing on all cylinders. The songs were a little more atmospheric and the quirkiness was toned down a bit. With that being said, the album’s moodier feel added more texture to the songs. ‘Don’t Look Now” is the closest thing the album gets to ‘immediate’ but repeated listenings reveal an album that takes the first album’s sound into a calmer, less esoteric place. Working without a full-time guitarist certainly gave the songs a different feel that actually compliments this set of recordings. Barracuda is a perfect companion to the debut, especially now that it has been expanded to two CDs containing tracks from Mixing, rarities and seven live tracks. Unshy On The Skyline: The Best Of Rupert Hine is both an excellent collection of tracks from his first three ‘80s albums and a frustratingly short introduction into his brilliant career. Anyone fan who puts together a compilation featuring songs from Immunity, Waving Not Drowning and The Wildest Wish To Fly is going to have their own opinion in regards to Rupert’s best tracks but nearly all of them would choose to fill up an 80 minute CD with as many songs as possible but that is not the case here. In my opinion, a ‘best of’ Rupert Hine should be an eight CD set featuring the three above mentioned ‘80s albums, The Deep End, the three Thinkman albums and the Better Off Dead soundtrack and nothing less. Alas, that was probably a bit much for the folks at Esoteric so they settled on this 12 track collection (four songs from each of the previously mentioned albums). Apart from that minor quibble, this is a moody and melodic collection with a great song selection and excellent remastered sound that enhances the atmosphere of Hine’s early ‘80s work. 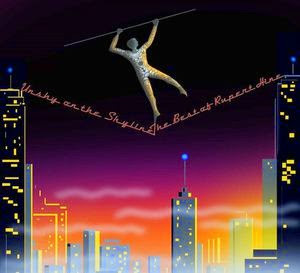 Unshy On The Skyline, the title taken from a line in “I Hang On To My Vertigo”, is the perfect introduction to the world of Rupert Hine, post-Quantum Jump and pre-Thinkman. With guest appearances from Robert Palmer, Chris Thomson, Phil Collins, Trevor Morais, Jamie West-Oram, and others, this is one heck of a listening experience. I’ve owned every one of these tracks for more than 30 years and they still mesmerize me. “The Set Up,” “The Wildest Wish To Fly,” “…Vertigo,” “The Curios Kind,” and “No Yellow Heart” have always been personal favorites but this set reminded me of how beautifully haunting ‘Dark Windows” is. Stunning. On many tracks, Rupert’s voice can sometimes resemble Chris Rea’s voice when he sings in a gravelly whisper but Hine seems to have more expression and range. In any case, Rupert Hine the artist needs some serious reappraisal and this set is your way to get to know him and his work. A truly great artist with far more talent than most people realize. Oh, and as if you didn’t figure this out already, all tracks were produced by Rupert and engineered by the great Stephen W. Taylor. P.S. I could swear that some of the backing vocals have been removed from "No Yellow Heart" but that might be my imagination....? Rupert Hine has produced beautiful and involved music that has haunted me since I was a child. When I first heart it I thought 'this is what the future is going to sound like'. Of course it didn't exactly - but I can't help wonder if his music might be rediscovered by a new generation of musicians - it has the potential to become it's very own musical genre. I'll listen to it now on the bus with my headphones (more than 30 years since I discovered it) and think, 'wow this is really effing great'. He hasn't released anything for quite some time but I can't help but wonder what wonderful things he has made for his own amusement over the years which we have never heard. I would love to hear them.